A modern silhouette and construction made of rich nubuck in black give this men’s lace-up shoe an ultra-sleek look. 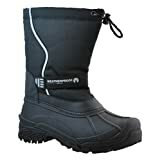 It’s lined in fabric and has a durable rubber outsole for all-over comfort. Adds instant style to denim, business suits, and dressy separates.